I attempted this trip back in March of 2014. I decided to club my Holi weekend to spend in “the heart of incredible India”, as Madhya Pradesh Tourism Board rightly advertises itself . This trip was on my list for a long time. However the time needed to travel all the way to central India from Bangalore always seemed tricky. As a backpacker, I resorted to travel by Indian railways, boarded Bangalore Rajdhani on 13 March, 2015. I still find train travels fascinating, for its unveils the subtlety of landscape and its people. One, indeed, needs to be a patient observer and for those who are, its an ever enriching experience to assimilate these subtleties. After covering almost 1500 kms over 24 hours, I reached Bhopal on 14 March 2015. It was late and sky was gushing down on earth with heavy downpour. I decided to rest for the night and start afresh next morning. 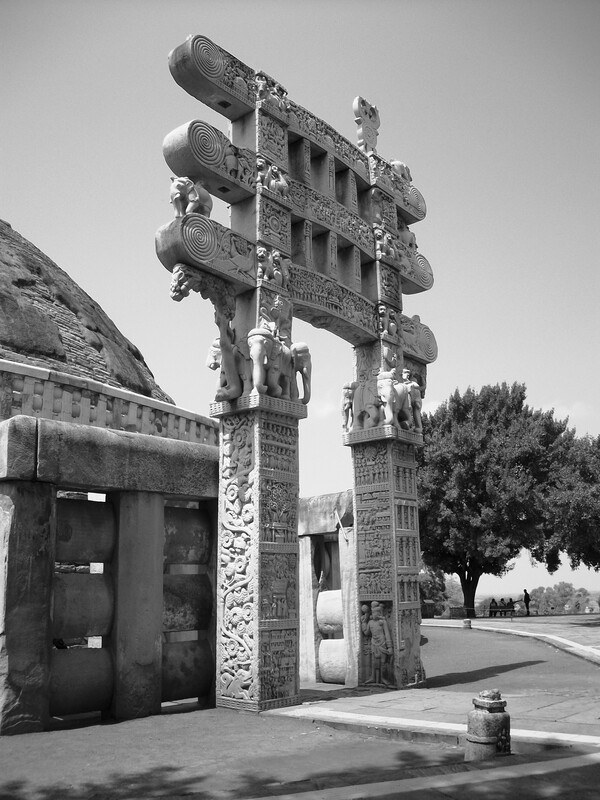 On 15 March, I headout to Sanchi Stupa. 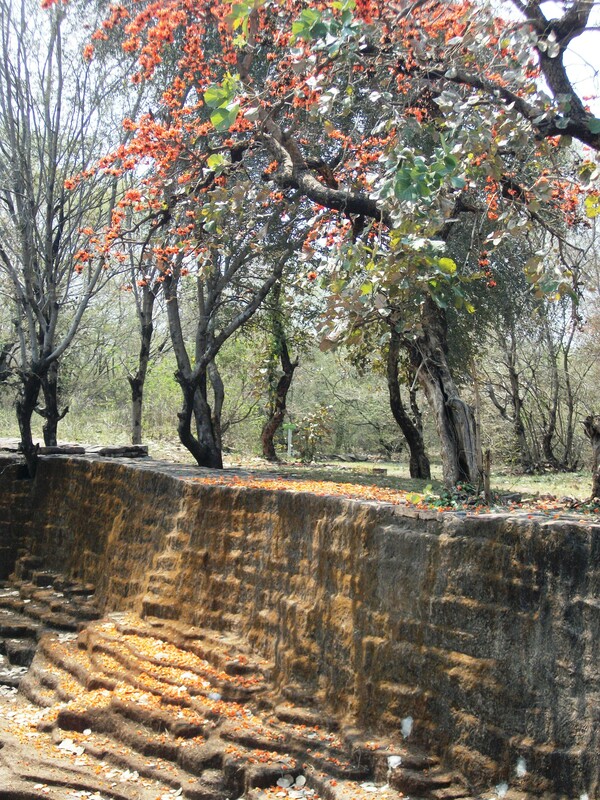 Located to the 45 kms to North-east of Bhopal. Its a stupa which contains relics of Buddha. Its pious for all who practise Buddhism. I saw lots of International tourists from south East Asia, who came to pay their reverences. What I found interesting about Stupa was its simple form and materiality. The stone joints were well embellished with engravings. I spent some quite peaceful time sketching these details. Below is the collage of very two distict colours of Sanchi – one etched hard in eternal stone, the other effervescent in temporal landscape of spring. Below is one of my one the spot sketches which I did resting beneath a tree that noon. Intent was to catch some respite from the noon sun and to document some engravings of the first ever Stupa in the world. The next destination was Man museum in Bhopal. Its an esoteric collection of anthroplogical studies about various tribes and their lifestyles and culture. I appreciate this museum for its thoughtful analysis of present scenario and not only a historic documentation of tribes across Indian subcontinent. The interactive modes of presentation were a happy departure from a monotonous exhibit typology of museums. The museum building is spread well over a landscape of 4 acres, it demonstrated life sized models of tribal houses and its households. Overall I found it very educative & informative. I could undoubtedly name it as one of the best cultural museums of india. This was all the adventure that I could attempt on day I. On the next day i.e. 16 March we started the day by taking a jog around the boat club. On my morning walk, I intereacted with local people who informed me that Bhopal is known as the city of lakes. Bhopal recieves its name from Bhoj and Pal meaning to administered under Raja Bhoj. The city’s water source in old times was the Bhoj Tal which was loosely translated to Raja Bhoj’s reservoir. British renamed it to Upper Lake because it had the highest topography and collected rain water for dweller’s consumption. Below is a small collage of the Raja Bhoj’s statue and Bhoj Tal in the back drop alongwith a vinettee of Gohar Mahal. Even today one finds ample of lush greenary and some beautiful historic buildings around. I spent the rest of my day shopping around Gohar Mahal for Chanderi and Maheshwari textiles for friends and family. Later in the afternoon, I started for the Jama Masjid. Its known as the largest open courtyard Masjid in Asia. The structure resembles the one in Delhi, but not as intricate indeed. When I was there, the Madarassa was in progress and the humming sound of the hymns still kind of ring in my ears. It was indeed a peaceful evening. Later I ventured to adjoining old city area to relish some authentic Bhopali cuisine. The islamic rulers of the regions (in medieval times) added various meat based preparations to the local cuisine, which was principally composed of vegetarian dishes. Achari Ghost, Dal Bafla & Bhopali paan caught my taste buds and I would suggest it to everyone who ventures out to Bhopal. For the next day, I had almost half of the day before I caught a Train back to Delhi to visit my parents on eve on Holi. I decided to visit Bharat Bhavan which was built by an eminent Indian architect Charles Correa Its a regional cultural centre with art galleries and exhibition / convention spaces. I fell in love with its open courtyard, which worked so well in terms of its spatial and human scale proportions. Its a beautiful regionalistic modernist building of 1980’s set on one edge of Bhojtal. I caught these glimpses of the building before, I decided to bade Bhopal a happy good-bye and meet it again in near future. Heart of incredible India Indeed. And you were like the blood flowing through the heart . Yet again , I’m delighted by your writings. The simplicity and yet the use of lexical words , all well balanced . Bhopal is indeed a beautiful place. Thank you for reminding of those memories . good luck and please keep on writing more.